Am I ever glad it is crumble season! 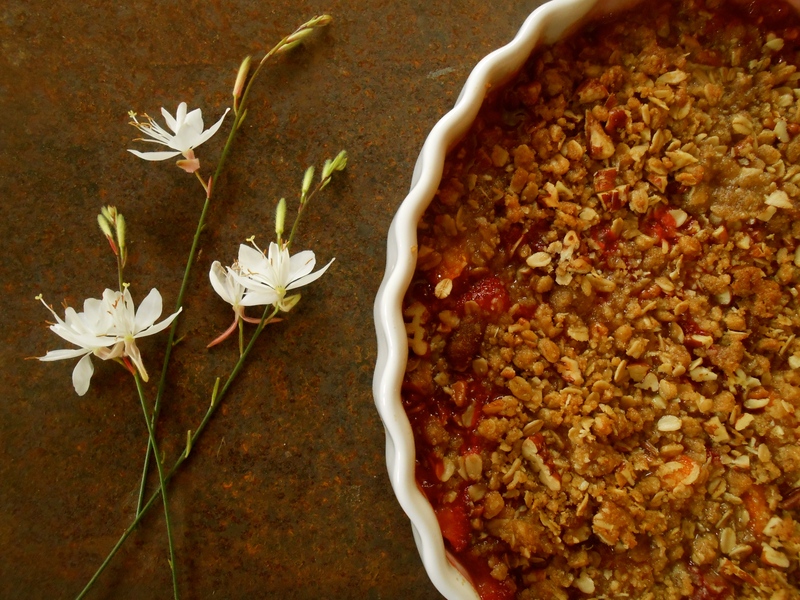 A simple crumble is the essence of summer. My favorite dessert involves baked fruit with either crust or a crumbly mixture of oats, nuts and butter. And here we have it. A homey apricot strawberry crumble, a little bit tart, slightly sweet, a crispy toasted topping and with a subtle hint of lavender. We have a ravishing lavender bush happily growing at the side of our house. It sits next to the rosemary bush and I think they are in a friendly competition to grow larger and more beautiful than the other. This area is the bumblebee’s main thoroughfare between the garden in the front of the house and the back. This little spot is a wonderfully buzzing place in our yard. And oh so fragrant too. I’m sure you’ve eaten lavender and enjoyed it—it’s one of the predominant ingredients in the mild, savory blend known as herbs de Provence. On its own, lavender has a lovely floral flavor with hints of mint and rosemary (it’s kinfolk) and, used correctly, it makes the perfect essence for cakes and of course, vanilla ice cream. A subtle amount of lavender adds a nice floral flavor. Combine all crumble ingredients in a medium bowl and massage together with your fingers until butter is incorporated and mixture forms small clumps. Refrigerate until mixture is cold, at least 30 minutes. Preheat oven to 350 degrees. Butter a 9 1/2-inch shallow round baking dish or pie plate. Place a non-stick skillet over medium high heat and dry toast the chopped pecans, shaking pan occasionally. Combine all filling ingredients in another medium bowl. Transfer to baking dish and top with crumble. Bake until bubbling in center and crumble is browned, about 40 minutes. Let cool at least 20 minutes. Yes this is the very essence of summer. Delicious and I love the lavender addition!! I know. Every now and then something comes out of the kitchen stunningly gorgeous. This is such a flavorful crumble. And I could eat the topping all day long! I love the fresh lavender sprigs sprinkled throughout the dish! Love the idea of adding lavender flowers here! :) Such beautiful colors. Just sort of came to me to use lavender flowers in a crumble as I was watering earlier in the day. I should find more uses for the lavender. Such a wonderful essence. Thank you! OMG this is stunning. I love lavender and crumbles. I like that you used rolled oats and fresh apricots. I’m in love with this recipe. It really does capture the essence of summer. You had me at lavender bush. Sigh! You and me both Amanda….lavender and crumbles. I was out watering the lavender and realized I had never used it in cooking or baking before. I was very pleased with the flavor. To be honest I was a little concerned before using it because lavender is so overused with soaps and fragrances and cleaning supplies. I didn’t want the crumble to taste “soapy”! It didn’t thank goodness. :) I really didn’t use too much, just enough to know it is present. That’s great! Yes, I find it’s a stronger scent than flavor. It lends a subtle sophistication that isn’t overpowering if you use it just right! This is truly the essence of summer.. Sweet strawberries and apricots, mingled with oats and lavender… It sounds heavenly… And looks glorious! I love the addition of lavender. We have a fair bit of it in the garden and I have not yet used it in a recipe. Hmmmmm…. Hmmm. I haven’t seen it much, but I can see why it’s trending! It’s such a wonderful aromatic essence. I have a huge bouquet sitting right in front of me, and it’s gorgeous and stunningly fragrant. You know I have 3 lavender plants and I never use them when baking, oh my goodness what’s have I been thinking, love fruit crisps. This looks delicious! This looks amazing. You are so smart to add lavender; I love it in butter, sugar and cakes. 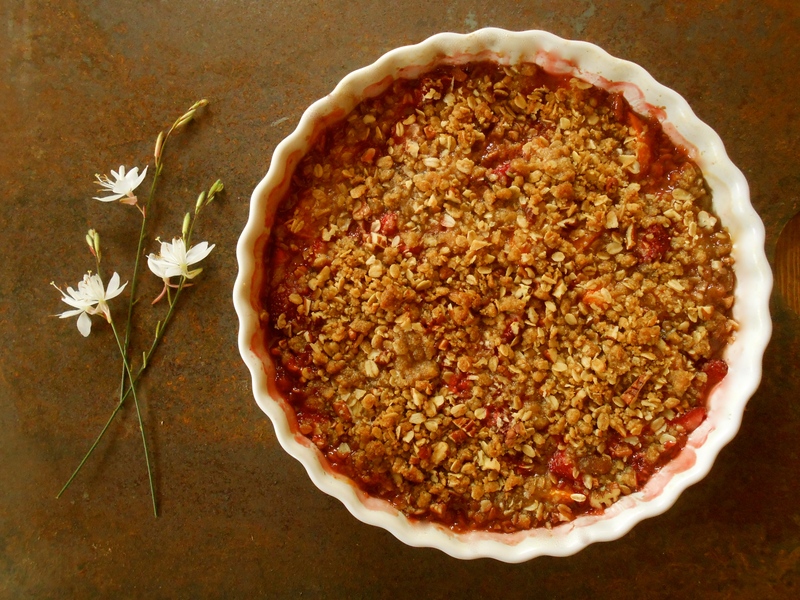 :-) There are few things better than a fruit-rich crumble during the summer months. Your family is so lucky to enjoy amazing, fresh desserts made with love. I will absolutely try this; my neighbor has lavendar (and, though I have herbs de provence, I will follow your recipe! ;-) ). I love crumble season, too! I still have not used lavender in cooking, and am quite jealous of your lavender (and rosemary) bush. All we have growing are inedible shrubs. Your crumble looks beautiful and tasty with all those good ingredients! Oh Seana, I’m so envious that this isn’t on our table right now! Already this would be a delicious crumble, but the added touch of lavender to give that floral note is just fantastic and something I must remember to try come summer! Delightful! Yes, I hung mine in three bunches to dry in my dining room. Just love the fragrance in the room and the rustic look of it. I’m totally with you about crumble! I love them all, sweet or savoury, I don’t care, crumble is always a good idea! 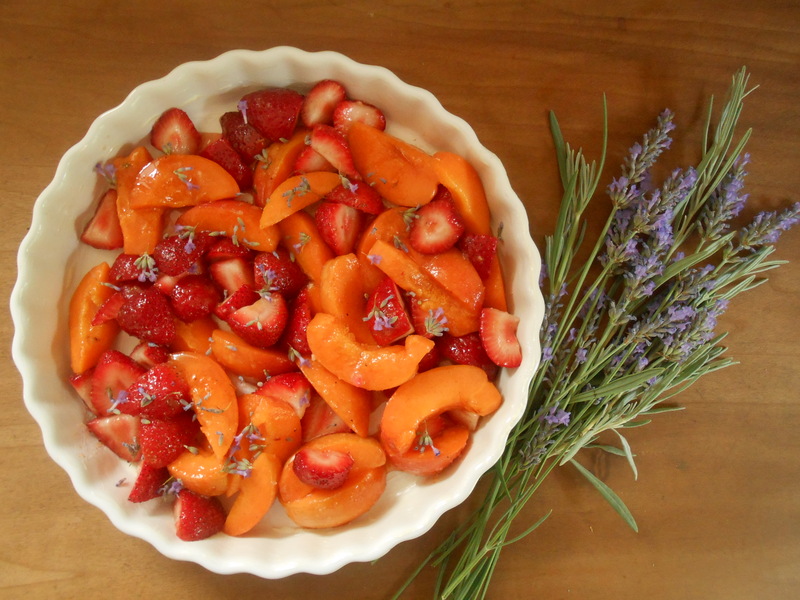 Last year I’ve tried to mix peaches and lavender, and it was scrumptious, I cannot wait to try with apricots! Thanks for sharing! Hmmm. I can’t say I have ever had a savory crumble. Now you have me curious. And yes, crumbles are a good idea. Even for breakfast. Oh no…the Polar Vortex must of wreaked havoc on so many levels I can not even imagine. I hope your plants come back vibrant and full of life Michelle. Love the addition of lavender! We make crumble all year round Seana, we never limit ourselves to summer. Your fruit combo with floral notes of lavender sounds wonderful..
Love to hear how it doesn’t matter the season, you make food you love year round. That is how I operate too! I am curious though…what would you use in a crumble this time of year? I imagine apple would be a wonderful crumble. Even for breakfast! I love this time of year. The fruit, the berries, the crumbles. Life is good! Hi John! It’s so great to see your presence here today. You have been one busy travelin’ man. I can’t imagine how you are able to keep up with all the comments on your posts let alone visit a tiny little blog like mine!! :) Nevertheless, I am honored you stopped in. Thank you. When I read the title, I thought you had used lavender honey because I have used that in a crumble before & it is heaven! Your crumble is a must make too! :) Yummm! Hi Seana– we have lavender and rosemary growing next to each other in our side yard too!–although the lavender is definitely taking over the landscape! 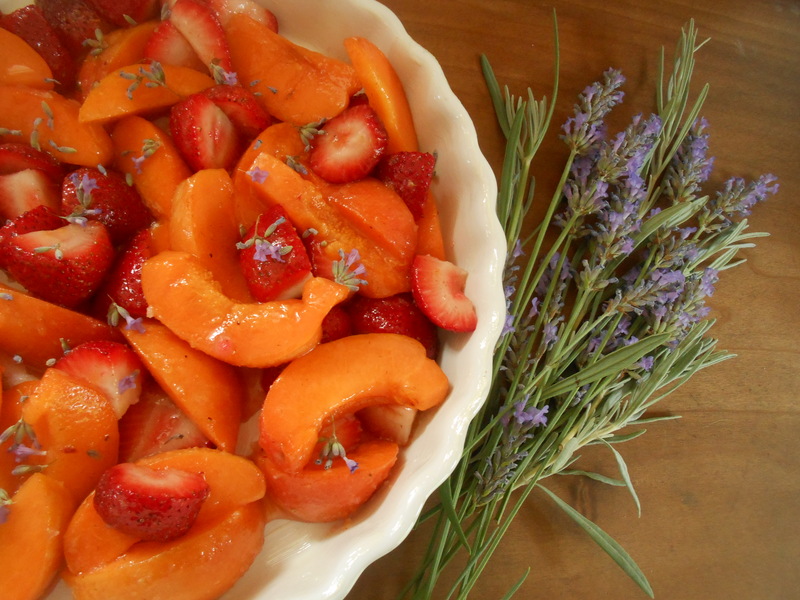 I’d love to try this– the photo of the lavender next to the fresh fruit is brilliant! thanks! Hello Rhonda and how interesting you have the lavender and rosemary side by side too! They do make good companions don’t they? This was a first to use lavender in any type of recipe and I was pleasantly pleased. Give it a try! Use sparingly…I think a subtle amount is perfect. thanks for the lavender tip– we had lavender honey ice cream the other day (BiRite in San Francisco)– delish! I love the flavors you have used in this crumble! Just lovely! Beautiful shots. Great job, Seana! I never knew lavender was kinfolk to rosemary! We have lavender farms around here in Central Oregon so I know it’s growable in these parts. I’ll have to see about planting some next year! Oh, and the crumble looks delish! Oh yes! Do plant some, what a wonderful garden plant. Even if you never use it in cooking! But, you’ll be happy to use a bit here and there in your cooking. Especially baking. Thank you and hope things are coming together for you in your move and whatnot! Delicious! Just love crumbles, but only home-made! It’s something I never order in a caffs anymore as they’re always disappointing – never enough crumble! And I’m curious about your use of oats and a pinch of salt (I have to have a pinch of salt in porridge). Will have to try this when it’s bearable to use my oven. As it’s only recently that I’ve started to use ol’ fashioned oats again. Such a great flavour. Yes! We agree with each other about crumbles. I have ordered them out and the topping is never quite right. I was curious about the salt too. And since I was using butter without salt I went with it. I imagine you’ll be happy with it since you use it in your porridge. I love ol’ fashioned oats Johnny. And I chose to use pecans in this instead of walnuts, which I prefer. Thank you for your feedback! Always a pleasure to hear from you! Perfect crumble – and love the use of lavender. I did not know it was one of the herbs de Provence. Fruit crumble is my favourite go-to dessert all year round. Lovely post and photographs. As usual. You are currently reading apricot, strawberry and lavender crumble at COTTAGE GROVE HOUSE.